What if there were a different way? For many moms, November and December come at a price that you don't need to pay. Magazines highlight the joy and beauty of the season, but for well-meaning parents, the holiday season feels far from picturesque and peaceful. It actually feels pretty stressful and downright anxiety provoking. School performances, office parties, extended family, sugar galore, presents to buy and wrap, kids home for holidays, 189 meals to make (at least 10 of them “special”)— all things we want to love but really just add more to our list, that is already pages long on a normal day. It is easy to to slap on a smile and, blame the craziness on “this phase of our lives,” and then look forward to January 1 when resolutions are possible. But… What if there were a different way? Happy, healthy holidays are totally doable with a plan — even with the 100 things on your to-do list! I know it is possible, because 6 years ago, I was I was in a major rut. I felt slave to the traditions that were created 3 generations ago. I felt the pressure of getting my kids everything they wanted. I felt like I should just get a bed in the kitchen because I never seemed to leave. I had this endless list of “shoulds,” and no space for wants. And right in the middle of it, I was solo parenting 3 kids while my husband worked. It seems only schools and babysitters get the full December holiday. The next year, I vowed, "never again," and I set out to make some changes. I put some systems in place, put some rituals into play, and 6 years later, I can say that I love the holidays! PlanSimple Holidays is a 14-session guided plan that will give you all the tools you need to balance food, home, downtime and work this holiday season! You get all the goods delivered to your inbox. You can do this work in a week, a day, over a weekend, or over a few hours. Simple tools that will get you loving November and December. You will make a plan for getting all things "home" in order — the kids rooms, the place the tree will go, and your gifts. You will make a food plan that maps back to how you want to feel — you will strategize the big days, family adventures, and parties — so you feel great in your body the whole season! You will design nurturing rituals that serve both you and your family. 14 sessions that each include an audio + planning sheets. The 14 sessions are: set the stage for success, make space, buy the "right" gifts, plan your meals, eat well on the go, create nourishing traditions, party like you want to feel, plan for vacation, work like a mom, cultivate gratitude, connect with those you love, set boundaries, find support, and celebrate. Creating an Advent Calendar has been one of my secrets to getting the whole family on board with a simpler holiday season. Get TWO BONUS calls to get yours done! 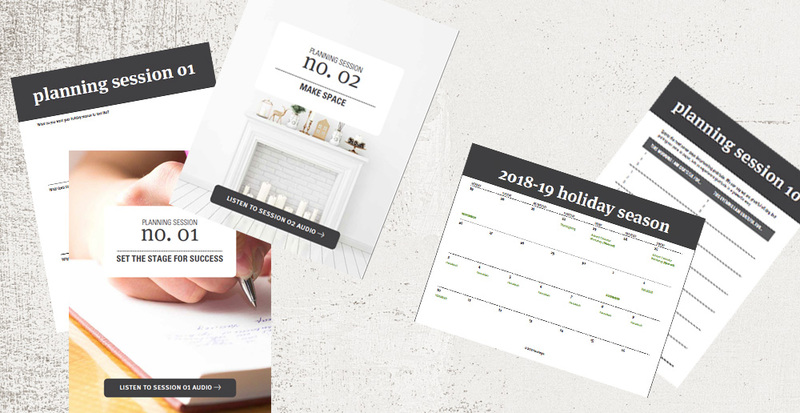 Get Mia's New Year Planning Process and Planning Sheets, so not only will you rock December, your will Thrive in January!